We also offer Mercury outboard parts. Seloc manual 1404 (book) covers all 2-40 HP, 1- and 2-cylinder, 2-stroke models, 1965-1989. View the Table of Contents for this manual. LOOK INSIDE to see sample pages. Seloc manual 1406 (book) covers all 3- and 4-cylinder 2-stroke models, 45-115 HP, 1965-1989. Seloc manual 1408 (book) covers all 90-300 HP, inline 6 and V-6, 2-stroke models, 1965-89, including fuel injected units. Also includes MR drive information. Seloc manual 1416 (book) covers all 1- to 4-cylinder and V-6, 2-stroke models, 1990-2000, including fuel injected units. Seloc manual 1705 (book) covers all 2.5-225 HP, 1-4 cylinder and V6 models including jet drives. 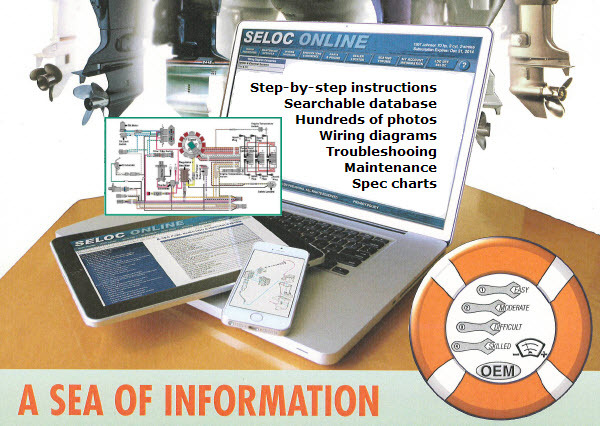 Seloc manual 1418 (book) covers all 2.5-250 HP, 1-4 cylinder and V6 2-stroke models including jet drives. Seloc manual 1422 (book) covers all 2.5-350 HP, 1- to 4-cylinder, V6 and V8 4-stroke engines including jet drives. Purchase access to the online repair and maintenance manual for your specific Mercury model for three years. You will choose your year and model during registration and will have access to that one model for the subscription period.